Information Security Media Group’s Fraud Summit Chicago was held last week, where security executives concluded that there is a growing need to share cyberintelligence with smaller institutions. The fraud landscape is changing, and community banks and credit unions need to keep up. But the problem is, they might not have enough resources to do so. While joining groups such as the Financial Services Information Sharing and Analysis Center (FS-ISAC, for short) could help these institutions get useful updates on what to do with their security strategies, executives at such institutions say that they have very limited budgets for the types of membership fees this would require. Their budgets for security technology and staff aren’t much bigger either. One community bank executive at the summit revealed that his security department (which also happens to be the fraud and IT departments) consists of only three individuals – one of which was himself. He noted that not only did they not have the necessary funds to join the FS-ISAC, they also wouldn’t have the staff needed to keep up with the security group’s updates and information. 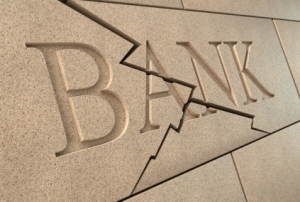 With such dire circumstances, the banking industry is getting concerned that community institutions don’t have a real handle on the types of cyberthreats and risks that are emerging. David Pollino, a fraud prevention manager at Bank of the West, names cross-channel fraud as an example. Larger institutions are beginning to see that cross-channel fraud is a serious threat, since they have access to big data analytic technology that gives them a good look into their fraud losses. However, according to Bank Info Security’s 2014 Faces of Fraud survey, many smaller institutions do not see cross-channel fraud as a major problem. Now, Bank Info Security is calling on larger banking institutions to spearhead the effort in helping out smaller community banks and credit unions fend off threats. In fact, the Federal Financial Institutions Examination Council and the Office of the Comptroller of the Currency have already decided that cybersecurity efforts are going to be ramped up this year for these smaller institutions. Small businesses need an independent ethics reporting company they can trust, one that is dedicated to safeguarding their operators against risk. Whistleblower Security is committed to promoting a culture of integrity, collaboration and transparency for our employees and clients. With a 24/7 whistleblower hotline, employees can be assured that all of their ethical concerns will be heard and addressed.